There is an old American motoring adage which states that there is no substitute for cubic inches. Basically it means that when it comes to engine performance, the bigger the engine's capacity the better. 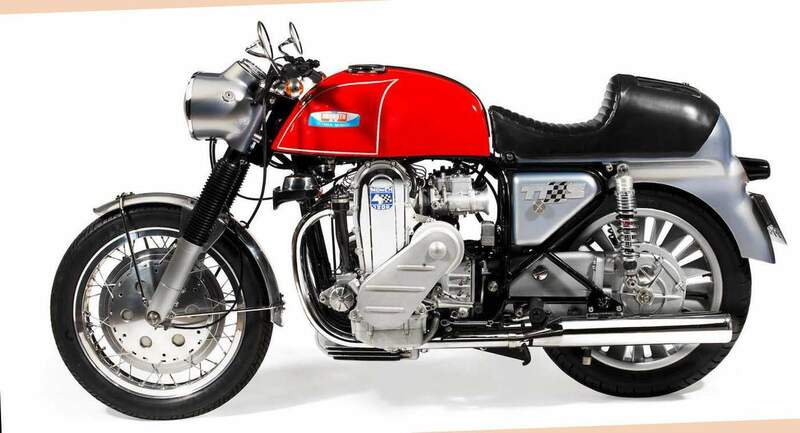 This theory must certainly have been close to German Friedl Mlinch's heart when he set out to build a super new motor cycle during the mid-1960s. For maximum performance Munch decided to use a car engine and after a good look at all the available options he settled for the four-cylinder unit normally fitted in the NSU Prinz. Getting his project off the ground was a tricky business, however, and Mlinch's subsequent history is strewn with financial problems, failed business partnerships and a great deal of heartache, soul searching and confusion. Whatever his commercial problems, however, Munch's bikes are well worth a second look. 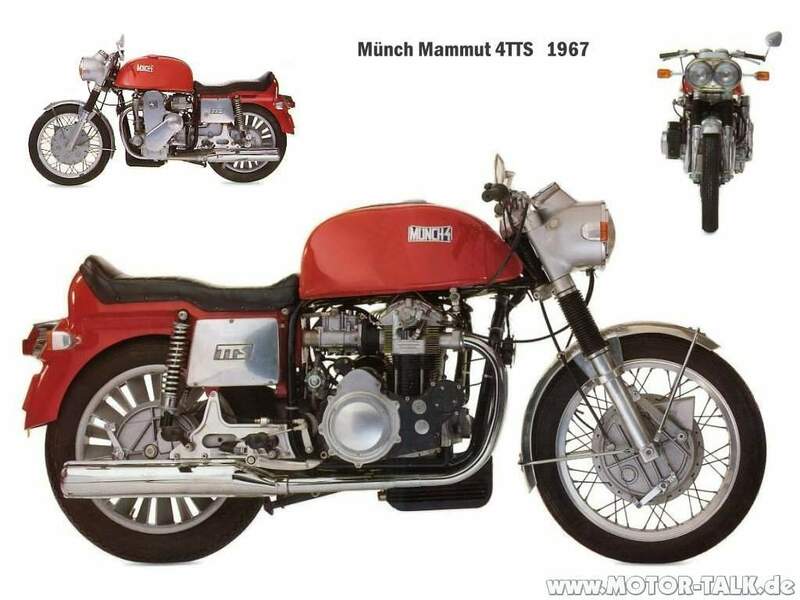 Probably the best known of all the Munch models is the standard 1200TTS of the mid-1970s, a super-bike in every sense of the word. 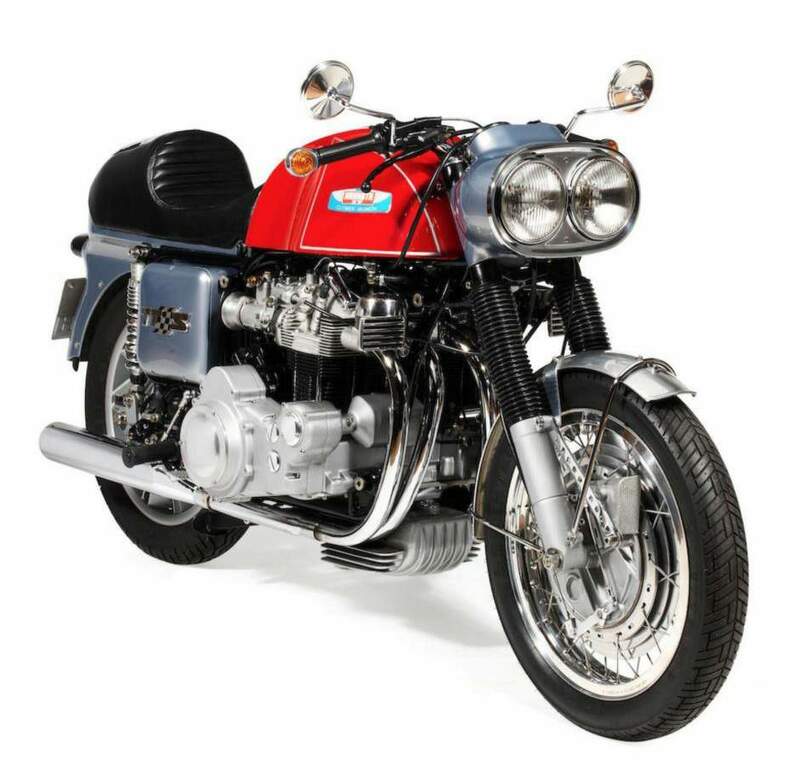 The power unit was a single-overhead-camshaft NSU engine of 1177cc which punched out 88bhp at 6000 rpm, with two twin-choke Weber carburettors, or 100bhp at 7500 rpm in its later, fuel injected form. 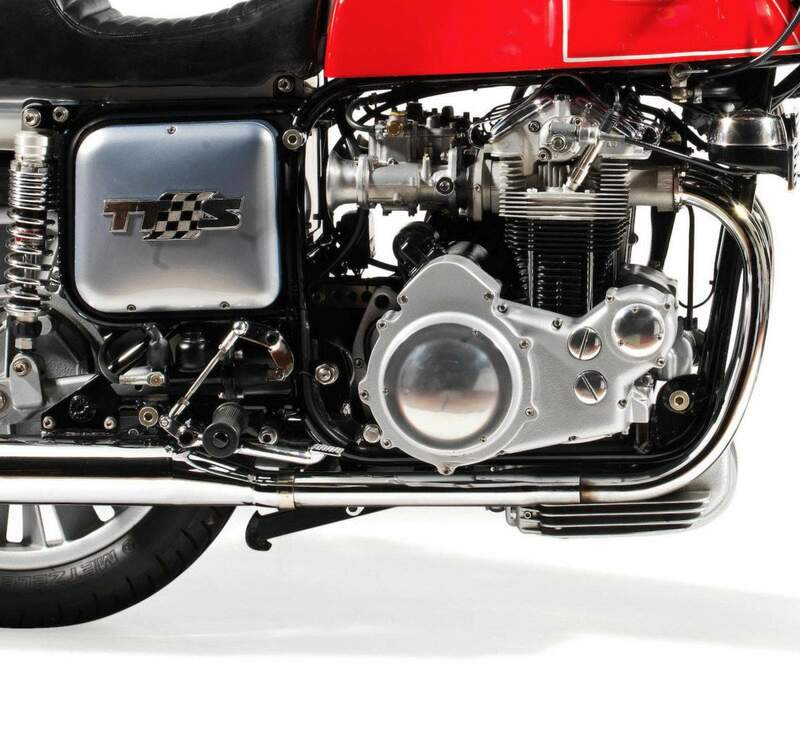 The 1200TTS used a four-speed gearbox developed from the now obsolete German Horex Imperator vertical twin of the late 1950s. The gearchange, while effective, was somewhat rough, however, a sign that the mating of car engine to motor cycle gearbox was not without its problems. For those rather braver riders who required even more performance, modified 1300 and even 1400cc versions were also available. 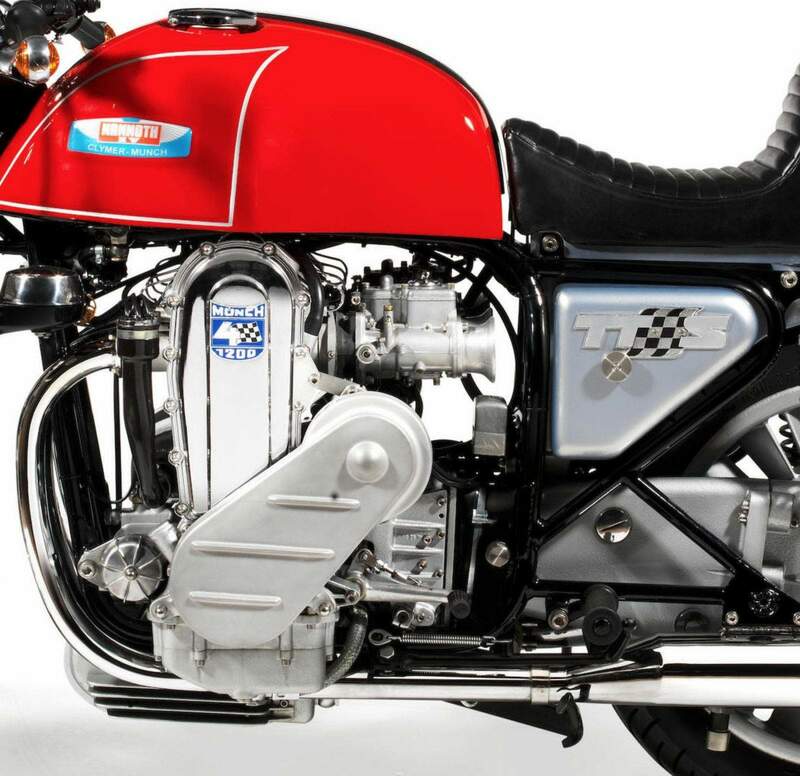 In appearance, the 1200TTS was an imposing machine. It carried a large, 5-1/2 gallon fuel tank, which gave it a strange hump-backed look in spite of its 55-1/2 inch wheelbase. A nice touch was the addition of a huge all-enclosed final drive chain, complete with its own oil bath. The earliest versions of the Munch were reputed to handle badly; the combination of a heavy car engine and lightweight frame needed a great deal of sorting to work efficiently. 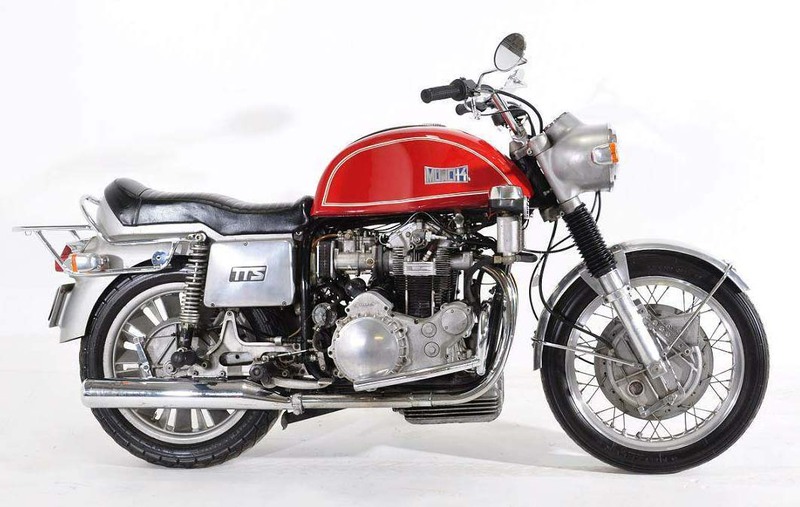 By the mid-1970s, however, the handling of the 1200TTS models had improved beyond recognition, but was still hardly in the sports category, of course. Weighing 630 lb meant that the big machine could not be thrown around like a lightweight and its real forte was as a high speed cruiser. 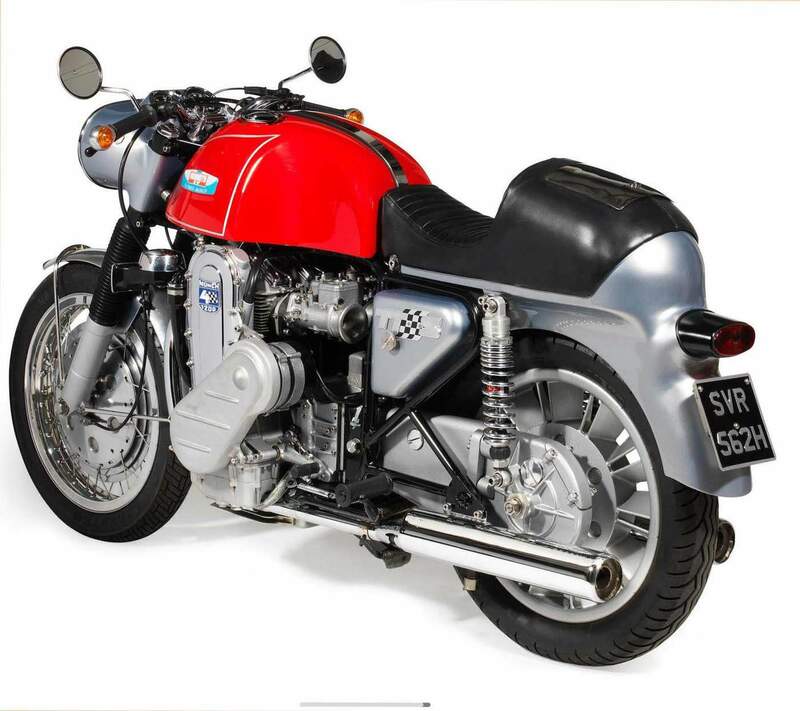 The roadholding, however, was first class, as the rear suspension made use of highly effective Koni damper units, while the front forks were the work of either the British Rickman or Italian Ceriani companies, depending on the owner's order. Braking was also very effective, the front wheel being equipped with a huge, 12 inch, magnesium drum brake. The last Munch fours had Marzocchi forks and dual front discs, but very few of these were ever made. By the end of the 1970s, however, recurring financial problems meant that Friedl Munch was forced to sell his company and bring production of his beloved machines to a standstill. Munch is nothing if not a dedicated man, however, and at the Cologne Show of 1978 he announced details of his new company and then showed the startled world his latest creation. It was powered by a 1400cc NSU car engine fitted with a turbocharger and fuel injection, for which a power output of 143bhp was claimed. The new bike bore the Horex name, a make which had played an important part in Friedl's life as a young man. Only one question remained, however. Was the world ready for a machine with that kind of performance? Only time would tell.